Crime in South Africa, like everywhere else in the world, has become something so prevalent that citizens have started finding ways to live around it. While some put the blame on our violent past and others reveal lack of confidence in our law enforcement, it’s still clear as daylight that the country is facing something that’s fast becoming a crisis. On October 24, the South African Police Services released its annual crime statistics that showcase charges that have been filed with police stations over the period 2016-17, irrespective of whether or not they led to a conviction. The stats, reflecting the most recent financial year, show that 2,129,001 serious crimes in 2017 were recorded – with a slight increase from the 2015/16 number which was 2,126,552. Four categories were reported on and they include contact crimes (murder, attempted murder, common assault, robbery), contact-related crimes (arson, etc), property crime and other serious crimes (commercial crime, shop-lifting, bank robberies, break ins, cash-in-transit heists, hijackings). Of all the four categories, one that showed an increase from the previous year is the last category which includes car hijacking; a major challenge in the country. In 2016/17, it’s been found that 16,171 cases of carjacking were recorded – the highest number witnessed in the past 10 years. This has gone up by 14.5% from the 2015/16 figure which was 14,602. It’s said that on average, 45.8 cars are hijacked per day in South Africa. 2012, 2013 and 2014 are reported to be the only years that the country experienced a decrease in carjacking incidents. 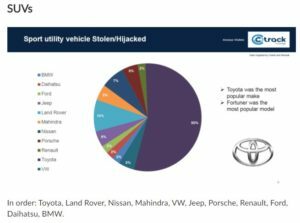 Ctrack, a vehicle tracking company released data back in June that revealed three of the most hijacked cars in South Africa. 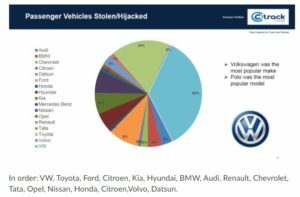 According to the findings, the VW Polo is the most hijacked car and takes the number one spot on the list. The Toyota Fortuner takes second place as being the most hijacked SUV, while Ford makes it to number 3. All these three cars are featured in South Africa’s top 10 best-selling vehicles which was made public in May 2017. The Volkswagen Polo and Polo Vivo are currently the first and second best-selling cars with the Toyota Fortuner placed at the third spot. At Future Express, we have made it a point to provide cars that are not susceptible to crime as our consumers’ safety matters the most. As noted above, none of our fleet options feature anywhere in the top 5 of the most stolen/hijacked vehicles. In fact, BMW is the least hijacked sport utility vehicle. Speaking of BMW, the automobile company set out to provide a vehicle that would be tailor-made to specifically protect against criminal attacks and other hazards. It then unveiled the X5 Security as the model that met this goal and offered maximum protection and comfort. The extra protection is aimed at preventing threats posed by carjacking, robbery and kidnapping. The BMW X5 Security meets VR4 Ballistic Protection guidelines set according to BRV 2009 and provides reliable protection against any type of street crime such as vehicle attack caused by blunt instruments or handguns of calibres up to .44 Magnum. The model’s windows are fitted and reinforced with a polycarbonate layer that protects passengers from shattered glass, putting them at less risk for a smash and grab incident. The passenger compartment is also created out of materials that include high-performance fiber-reinforced substance along with bulletproof steel in important areas. Lastly, BMW incorporated an intercom system and an assault alarm that allows for communication with individuals outside that can come to the rescue, without risking opening doors or the windows. The activation of the alarm automatically locks all windows and doors, and both audio and visual alarms become engaged too. Another factor that has been highlighted by The Automobile Association (AA) is the need for more cars to be manufactured with safety features as a priority. “The purpose of the research, the AA said, is to highlight the importance of safety features in new cars, understand how these features can save lives, and encourage new car buyers to consider safety in their decisions, and not only price.”, said the AA. Jaguar places the utmost importance on safety features and has invested in driver assistance and several security elements. Blind spot monitor and reverse traffic detection – Warns of vehicles, pedestrians or other hazards approaching from either side of the car, especially when reversing out of a parking spot. This is certain to make a difference in trying to curb road accidents as Road Traffic Management Corporation (RTMC) reported that 14,071 people died on South African roads in 2016 – a harrowing fact that has urged car manufacturers to start considering the importance of active safety features. In all that we do, our bottom line is to get you to your destination safely, on time and in style, safe and secure. This is why our fleet consists of models that promote protection, such as the BMW X5 and Jaguar. Contact Us today for more information on our corporate transport packages and see which one caters to your needs the most! Africa Check. 2017. FACTSHEET: South Africa’s crime statistics for 2016/17 | Africa Check. [ONLINE] Available at https://africacheck.org/factsheets/south-africas-crime-statistics-201617/. [Accessed 26 October 2017]. BMW. 2017. Security Vehicles. [ONLINE]. Available at https://www.bmw.co.za/en/topics/offers-and-services/corporate-direct-sales/security-vehicles/overview.html. [Accessed 26 October 2017]. Jaguar Global. 2017. Jaguar XF | Vehicle Technology | Jaguar. [ONLINE] Available at https://www.jaguar.co.za/jaguar-range/xf/features/in-car-technology.html. [Accessed 24 October 2017]. Massive increase in hijackings in South Africa. 2017. Massive increase in hijackings in South Africa. [ONLINE] Available at https://businesstech.co.za/news/lifestyle/186281/massive-increase-in-hijackings-in-south-africa/. [Accessed 24 October 2017]. The most hijacked cars and car brands in South Africa. 2017. The most hijacked cars and car brands in South Africa. [ONLINE] Available at https://businesstech.co.za/news/motoring/156635/the-most-hijacked-cars-and-car-makers-in-south-africa/. [Accessed 25 October 2017]. These are the 3 most hijacked cars in South Africa. 2017. These are the 3 most hijacked cars in South Africa. [ONLINE] Available at https://businesstech.co.za/news/lifestyle/182049/these-are-the-3-most-hijacked-cars-in-south-africa/. [Accessed 25 October 2017]. These cars are the least safe to drive in South Africa. 2017. These cars are the least safe to drive in South Africa. [ONLINE]. Available at https://businesstech.co.za/news/motoring/206879/these-cars-are-the-least-safe-to-drive-in-south-africa/. [Accessed 25 October 2017].